Pre-wrapped or homemade bars can be a great choice for a quick and portable snack. With all the claims on the labels, how can you tell which ones are best? I’m a big advocate for eating fresh, real, and seasonal foods, but we’re all busy people, so the right nutrition bar can be a beautiful thing. Here’s a quick guide for what to look for and a few of my favorites available in the U.S. I often get asked how many calories a bar should have. Caloric needs differ widely by age and activity. Is it a quick pre-exercise snack, post-exercise recovery snack or is this a meal replacement because of lack of time? 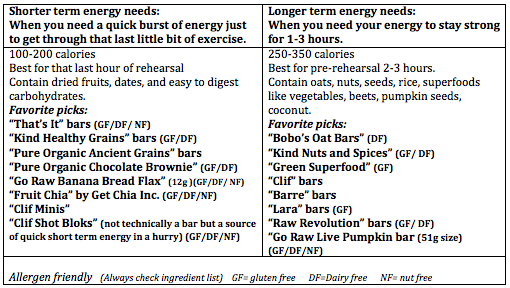 Short term energy needs may be fulfilled by only 100-200 calories, but longer term energy calls for higher calories to meet working muscle’s needs (see chart). More protein in a bar isn’t automatically a good thing. Don’t judge a bar by its protein content. Pre-exercise it’s better to have a bar with carbohydrates since carbs are the preferred source of fuel for athletic activity. High protein bars (exceeding 20 grams) won’t give you energy in the same way that complex carbs will. It’s better to get protein through real food, but if you must rely on a bar for your protein, then aim for the 5-15 gram range and eat them after exercise as recovery fuel. Good sources of protein in bars are hemp, soy, nuts, and seeds. Some bars can be glorified candy bars so try to aim for less than 15 grams of sugar per bar and few if any added sugars. Certain Kind bars have only 5 grams each, but other bars can have up to 30 grams from multiple sweeteners. Sugar comes up on a label in many ways, if it’s listed first on an ingredient label, that’s a problem. Natural sugar is better, such as in dried fruit. Clif Bar makes Kit’s Organic Fruit and Nut bar with 16 grams of sugar and Lara bar’s Apple Pie has 18 grams of sugar but the only source of sugar is from dried fruit, a source of quick burst energy and iron. Amazing Grass makes bars with 20+ grams of sugar but only sweetened with dried fruit and agave syrup. Limit refined and artificial sugars like high fructose corn syrup, aspartame, sucralose, brown rice syrup, and dextrose. Other words for sugar are: maltose, sucrose, glucose, barley malt, and rice syrup. Sugar alcohols can sneak into nutrition bars too. They can potentially cause intestinal discomfort. Look out for xylitol, mannitol, sorbitol, and isomalt. Avoid bars with these preservatives, additives and food colorings such as TBHQ, BHT, partially hydrogenated palm kernel oil, yellow 5 and red 40 which have been linked to learning problems and hyperactivity in children. Read your labels, and if it sounds like a science project, don’t buy it. One popular strawberry breakfast bar didn’t even have any strawberries in it. It had “Strawberry flavored fruit pieces” which were sugar, citric acid, colorings, and flavorings. Look for real food ingredients that you recognize. Allergens are required to be listed in an allergen statement, but check the ingredients list to be sure. The word “energy” on a label can be code for added caffeine, and the word “natural” isn’t legally defined in the U.S. so it can mean anything. It’s sometimes hard for people with allergies to travel or grab something quick on the road. This list tries to indicate allergen friendly bars manufacturers, but always check the label because each flavor can be a bit different and call the manufacturer if you are unsure. 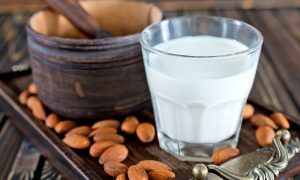 Be aware that whey protein is a common ingredient in protein bars but it is derived from milk and can be problematic for those sensitive to dairy. Hemp or soy protein could be a better choice. Wheat free doesn’t automatically mean gluten free. By Emily C. Harrison MS, RD, LD Centre for Dance Nutrition. 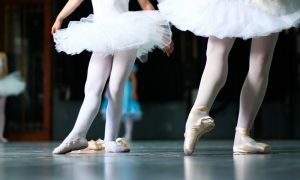 To learn more about dancer health and nutrition, visit www.dancernutrition.com.